Julie's Creative Lifestyle: Wordless Wednesday - Spring Flowers! I took a photo of these pretty flowers while walking my dog Bosco. Beautiful flowers. After a cool spring, mine are just starting to bloom. Wonderful flowers, Julie! The color is really amazing! Purple is my favorite color! It's so beautiful! These are Prairie Phlox (phlox pilosa). They are a perennial across much of the US and have a lovely fragrance. Nice shot! Julie, Nice walk, your flowers are so pretty. I just followed you on Google Connect. Thanks again for stopping by this week. Have a great memorial weekend! And thank you for adding my WW to your post. Well all I know is that they're pretty and lilac is my favorite color :) And I'm following you already on all your social networks! Thanks for putting my WW up on your following list! So nice of you! Guess that's why I followed everything cuz I knew you were nice????? hehehehe yeah I did :) Have a great day! they look like my purple creeping phlox I have in my front garden. One of my favourites for sure. They just pop with colour. Cheerful and pleasing to the eye! Beautiful. I love spring flowers.. the sign of new growth. Thanks for linking up to my Almost Wordless Wednesday and I hope that you will join me again this week. 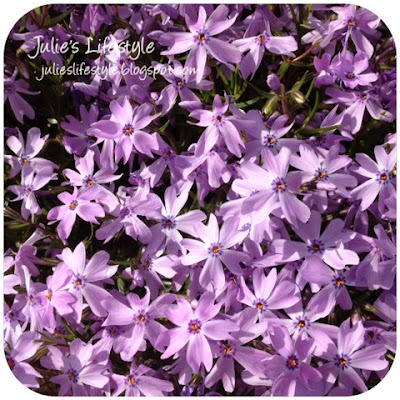 © Julie's Creative Lifestyle: Wordless Wednesday - Spring Flowers!